A glance at the sheet music for Duruflé’s Requiem suggests a complex, contorted, and inaccessible work. Time signatures, for instance, shift on a measure-by-measure basis. Yet when you listen to this choral masterwork—the most poignant and exquisitely beautiful Requiem extant—it sounds strikingly simple and inviting. That’s exactly what Duruflé was after, which is why he based the piece on Gregorian chant. Yet he also strove to modernize that style’s rigid incantation to a more modern, natural delivery. This meant adapting rhythms to the text—rather than vice versa—resulting in a score that’s difficult to perform yet, when done right, sounds like no effort at all. Ah, but there’s the rub: doing it right. Duruflé’s intended flow will elude all but the most skilled singers, players, and conductors. At the same time, capturing such a performance presents a challenge to even the most accomplished sound engineer. That’s because, although this Requiem eschews the Sturm und Drang of those by Verdi, Berlioz, and Mozart, there are still plenty of climactic moments that push the audio envelope. Having sung this Requiem on many occasions at Washington’s Kennedy Center, I am intimately familiar with both the piece and its real-life sound. So I recently set out to find a recording that did justice to it both musically and sonically. Even more, I wanted to find a worthy example of each of the three versions Duruflé wrote: chorus and organ alone; chorus, organ, and chamber orchestra; and chorus, organ, and full orchestra. Just to keep things manageable, I stuck with digital formats—for now. In the end, I listened to over a dozen Duruflé Requiems. The three best appear on the following releases. 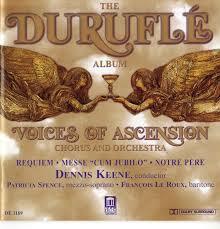 The Duruflé Album. Voices of Ascension Chorus and Orchestra, Keene. Delos (CD). For singers, Robert Shaw is usually the go-to conductor. True to form, his Telarc release boasts exemplary choral diction, intonation, blend, and control. Musically, Shaw’s rendition is quietly moving, even if his tempos are a bit sleepy at times. Unfortunately, that disc suffers from the nascent state of mid-80s digital technology. Though there’s no shortage of dynamic range, vocals “shatter” at their biggest moments. The recording is further marred by a lack of openness, which is both a sonic and emotional damper. Enter Dennis Keene and his Voices of the Ascension. The orchestra and chorus may not be as large as Shaw’s, but you’d never know it. Keene’s groups bring out this work’s every nuance and power through its climactic moments. Keene takes an unhurried pace that infuses his reading with a sense of mystery and spirituality. Even the solo in the poignant “Pie Jesu” is chillingly effective. The estimable John Eargle recorded Keene’s performance back in 1995. Technology had moved ahead ten years since Shaw undertook the piece, and there is a big improvement in openness. Indeed, the sound is quite commendable—in soft passages. When things get big, the glass-shattering effect is evident. I did find better-sounding large-scale recordings, but none that approached Keene’s superb rendition. 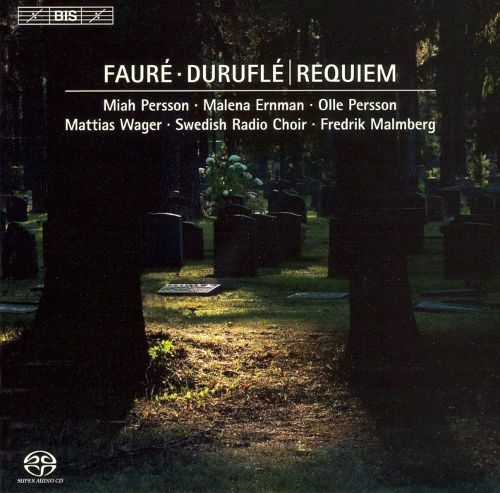 Duruflé Requiem. King’s College Choir, Cambridge, Cleobury. (CD and HighResAudio.‌com 96/24). The best-sounding recording in this category—indeed, in the entire survey—is Harmonia Mundi’s CD/SACD/download featuring Bill Ives and the Choir of Magdalen College, Oxford. However, that album also contains the worst performance I encountered. But Stephen Cleobury and his Choir of King’s College prove that small forces can be effective when marshalled with sensitivity. The singers here are in perfect balance, and the orchestra is just big enough to support them without overpowering the organ. 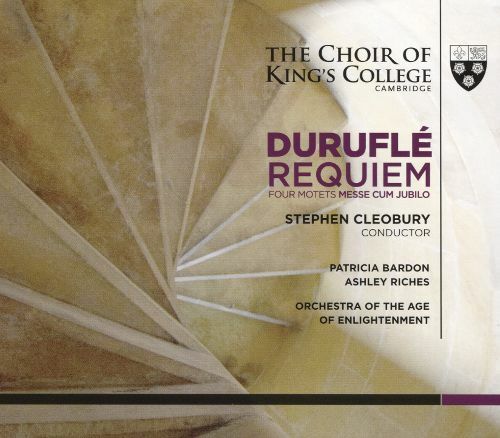 Although the most dramatic crescendos are, by definition, restrained compared to the Keene version, Cleobury is unerring in maintaining the music’s dramatic impact. The one misstep is the “Pie Jesu,” which runs into pitch problems early on and never recovers. That aside, this is a lovely performance accompanied by a hi-res download that, while not quite as clear as the Harmonia Mundi, admirably avoids sonic drama (in the negative sense) when things get big. Requiem. Faure, Duruflé. Swedish Radio Choir, Malmberg. BIS (CD, HDtracks.‌com 44/16, eClassical.‌com 44/24). The recording does its part as well. Though only available in 44.1 (even the downloads), the sound is largely free of digital artifacts. Voices are remarkably clear, including during the climaxes. Every word, turn of phrase, and dynamic nuance is on full display, as is the organ’s range of tonal colors.